Namesake: A small river in eastern Massachusetts which empties into the Altantic at the northwestern end of Buzzards Bay; and a town in Hampden County, Mass. Agawam is an Indian word meaning lowland, marsh, or meadow. The first Agawam, a double-ended, side-wheel, gunboat built at Portland, Maine, by George W. Lawrence, was laid down in October 1862; launched on 21 April 1863; and commissioned on 9 March 1864, Comdr. Alexander C. Rhind in command. Assigned to the North Atlantic Blockading Squadron, the steamer finally stood out to sea on 6 May , two days after the Army of the Potomac crossed the Rapidan River to begin General Grant’s offensive against Richmond which kept unrelenting pressure on General Robert E. Lee’s Army of Northern Virginia until it was bottled up in the siege of Petersburg and finally forced it to surrender at Appomattox. Agawam would perform most of her Civil War service in support of this drive. When she was finally deemed ready for active service, the gunboat departed Portland on 6 May, only two days after Grant’s troops crossed the Rapidan and the day after troops led by Major General Benjamin F. Butler landed on Bermuda Hundred, a large neck of land between the James and its tributary, the Appomattox River. This territory was strategically located some 15 miles south of Richmond and about seven miles north of Petersburg, probably the last important railroad center remaining in Southern hands. Butler’s operation was designed to cut the railroads and to take or, at least, to threaten these vital Confederate cities. General Grant, then General-in-Chief of the United States Army, hoped that Butler’s campaign would, as a bare minimum, interrupt the flow of food from the deep south and the west through Richmond to Lee’s troops. According to this plan, if Butler did not take the Confederate capital, his operations would draw significant troops away from Lee’s Army, starve it, and so weaken it that the Union force pushing down from the Rapidan would be able to overrun Richmond or link up with Butler and join in investing these key Southern cities. In any case, even moderate success on Butler’s part should quickly end the war. But moderate success for Butler was not forthcoming. 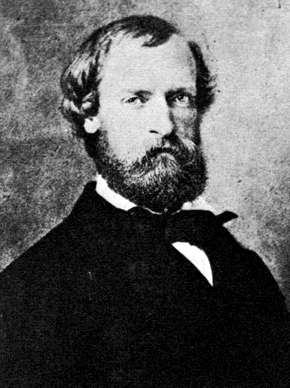 By the time Agawam reached Hampton Roads on 9 May, the Union commander had squandered his initial advantage of surprise by his hesitation to launch vigorous attacks toward his initial objectives, the railroad and the turnpike connecting Petersburg and Richmond. This delay enabled the Confederacy to bring major reinforcement to their previously almost undefended works in the area. Then, the presence of Southern soldiers in the area prompted Butler to remain within strong defensive lines where he could do almost nothing to help the Army of the Potomac as it fought its way toward Richmond in a series of bloody engagements beginning with the Battle of the Wilderness. Meanwhile, it was the task of the Union Navy to maintain control of the James lest Butler’s 30,000 troops at Bermuda Hundred be cut off and annihilated. Agawam reached Hampton Roads on 9 May and two days later stood up the James to join other Union ships in protecting Butler’s transports and supply ships which were threatened by torpedoes, shore batteries, and a possible attack by Confederate ironclads which were lying in the river above the Confederate batteries of Fort Darling at Drewry’s Bluff. The danger lurking in the muddy waters of the James had recently been emphasized by the sinking of Commodore Jones on the 6th while that side-wheel ferryboat was dragging for Southern torpedoes, or, in 20th century parlance, mines. On the 14th, Rear Admiral Samuel Phillips Lee, the commander of the North Atlantic Blockading Squadron, shifted his flag from Malvern to Agawam since the latter drew less water and thus would enable him to supervise minesweeping operations more closely, and he remained in the new side-wheeler while giving his primary attention to operations in the James during the ensuing month and one-half. 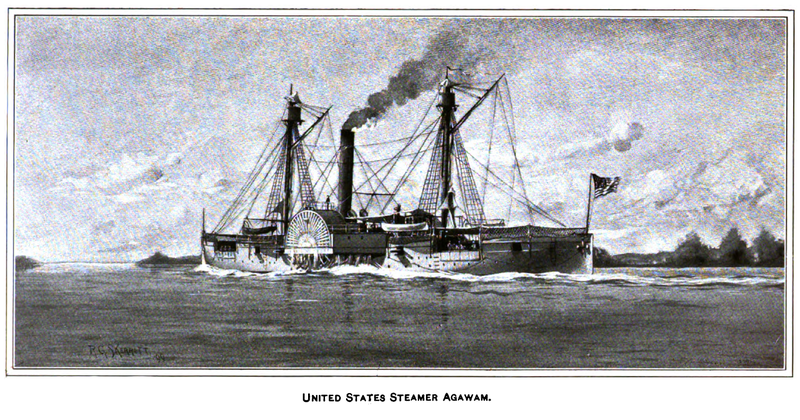 Agaivam’s first combat came at dawn on the 18th when she shelled Confederate forces “. . . intrenching the heights at Hewlett’s house, commanding Trent’s Reach,” a straight stretch of the river flowing east along the northeastern section of Bermuda Hundred. During this time, besides serving as the squadron flagship, she helped to clear the river of mines, was a mobile platform for observation of Confederate activity along both banks of the river, acted as an intelligence and communication clearinghouse, and used her guns to suppress Southern batteries ashore. Confident in the ability of his warships, Admiral Lee was eager to meet the Southern squadron and was hopeful that his flotilla might ascend James past the batteries at Drewry’s Bluff and capture Richmond himself the way Farragut had taken New Orleans. As a result, he constantly opposed obstructing the channel. However, early in June, Grant decided to shift the Army of the Potomac from its lines at Cold Harbor across the James to join Butler in operations against Richmond from the South. This plan made Union control of the River even more important and prompted Washington to insist upon blocking the channel. The first stone-laden schooner was sunk on 15 June and the operation continued until Army leaders felt safe from Southern ironclads. This barrier increased the security of Union shipping on the James and reduced the burden on the Union warships on the river, freeing Admiral Lee to attend to squadron matters elsewhere. As a result, he shifted his flag back to Malvern on the last day of June and returned to Hampton Roads. Agawam remained upriver where, despite the obstructions, she found ample opportunity to use her fighting skills. The presence of the tremendous concentration of Union troops south of Richmond had goaded defenders of the Confederate capital into desperate measures to interrupt Union shipping on the James. The day after Admiral Lee left her, Agawam and Mendota fired on a fortified position inside Four Mile Creek whence Southern five guns had recently fired upon Hunchback and, in the months that followed, frequently engaged batteries hiding along the banks of the strategic stream. Early in July , Lt. George Dewey, the future hero of Manila Bay, relieved Rhind in temporary command of the ship, his first command, but Rhind was back when Agawam fought her most memorable battle. About two hours past noon on 13 August , three batteries opened fire on the double-ender almost simultaneously from different locations, beginning an engagement which lasted over four hours before dwindling ammunition forced her to withdraw. During the action, three of Agawam’s men were killed and four wounded. Late in November , boiler trouble forced Agawam downstream for extensive repairs. While the ship was being brought back to fighting trim in the Norfolk Navy Yard, Comdr. Rhind left her temporarily to take command of Louisiana, a steamer which had been selected to perform an unusual and seemingly important task. Rhind took with him a carefully selected group of volunteers from Agawam to man his new ship. They boarded Louisiana at Beaufort, N.C., and took her to waters of Wilmington, N.C., for use as a giant bomb to help reduce the defenses of Fort Fisher which guarded that city, the only major port still open to Confederate blockade runners. After several days of delay because of stormy weather, Rhind took the ship close aboard Fort Fisher on the night of 23 and 24 December 1864. Her crew then set her ablaze, left the ship, and managed to row to safety before Louisiana exploded. The concussion failed to detonate the Fort Fisher magazine, and the ensuing amphibious attack proved to be abortive. The troops who went ashore on Christmas Eve to storm the Southern stronghold reembarked the next day and headed back toward Hampton Roads. Rhind and band of daring volunteers returned to Agawam which was still undergoing repairs. The work continued through mid-February , and the gunboat finally put to sea on the 16th. She entered Pamlico Sound, N.C., two days later and operated in the island waters of that state through the end of the Civil War.